Clay pot is an old Chinese traditional way of cooking a one pot wonder. Clay pots are not expensive and you can buy them from Chinese supermarkets. I got my small clay pot for £3 from Hing Sing Edinburgh Chinese store and the medium sized one for £15. Not bad considering how much ingredients/contents it can hold. All Chinese supermarkets/store will have them. Once you tried cooking with clay pots you will end up cooking with it more than you think. There are many recipes and you can just add in your own choice of meats, add in what you like, make your own version. Clay pot recipes are so versatile, you can use pork, spare ribs, chicken or salmon. It is a warming, satisfying dish especially in the winter season. I usually have friends with their fluffy bowls of rice, crowding round this special clay pot dish. It definitely gets the conversation going! This is truly a timeless one pot wonder loved by everyone and a firm favourite with the Hong Kong locals. 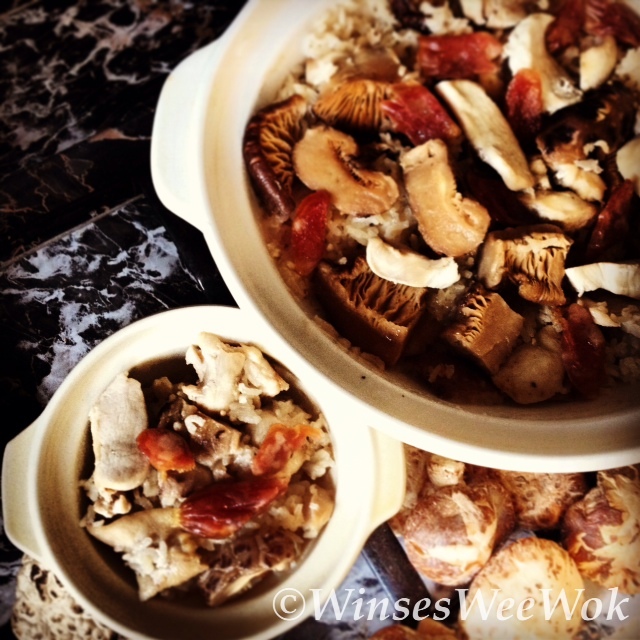 • Soak mushrooms in boiling hot water for 15 minutes. Squeeze out excess water, remove stalks and cut in halves or in strips. • Wash the rice contained in the clay pot four times, drain well using a colander and add 350 ml hot, boiling water. • In a separate bowl, add in sliced chicken pieces, sliced sausages, sesame oil, oyster sauce, soy sauce, chicken powder, ginger, mushrooms and chopped spring onions. Marinade for 10 minutes. 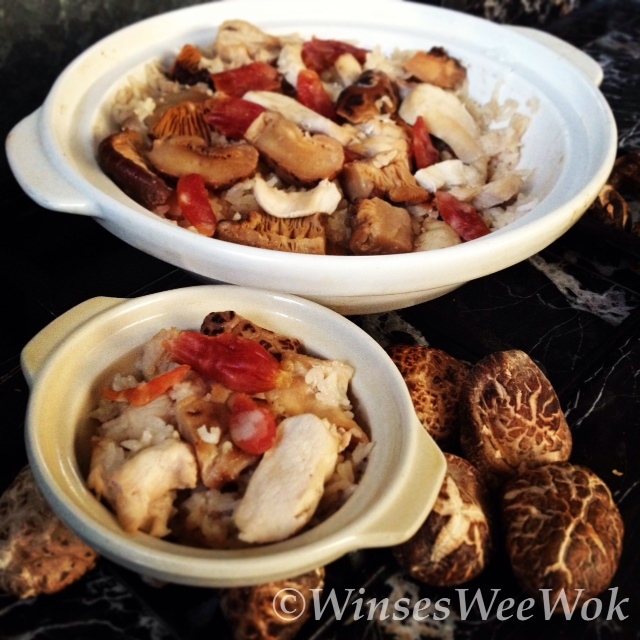 • Add the marinade ingredients on top of the rice in the clay pot. Stir twice, cover with lid and heat on a high setting for 5 minutes then reduce to a low setting. Simmer for 15 minutes. 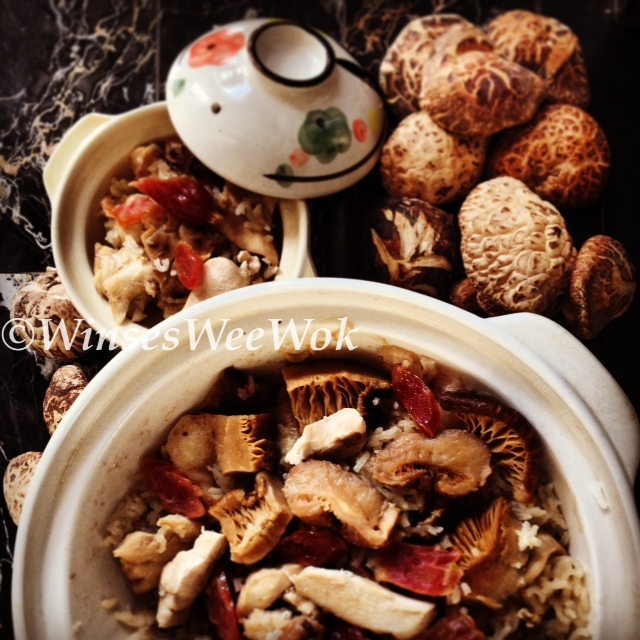 • Turn heat off and allow the ingredients to fuse in the clay pot for 15 minutes. Garnish with chopped spring onions. Serve.